Nine engaging stories about great prophets from the Bible - all very different but all chosen to be Loud Speakers for God. Patience, endurance, obedience and fearlessness, are just some of the different qualities the prophets showed. And people like Elijah, Jonah, John the Baptist and Anna all have very different stories to tell. This book introduces young readers to some of the less easy passages of the Bible in a simple way they will understand. Ages 6-8. - Publisher. 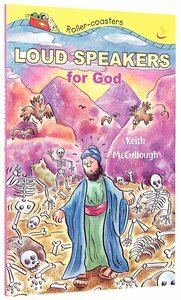 About "Loud Speakers For God (Roller-coasters Series)"
Nine stories about great prophets from the Bible. Each chapter is about a unique person and part of their life* Elijah, Ezekiel, Jeremiah, Jonah, Elisha, Isaiah, John the Baptist, Simeon and Anna. They each look at the different qualities the prophets showed, such as patience, endurance, waiting on God, listening to God, obedience and fearlessness. ;The book acts as a simple introduction to some of the less easy passages of the Bible with which young children may not be familiar. ;The idea of prophecy is explained and why God chooses to speak through individuals like this.